I was actually wrong. It seems even worse. Pygama is not capable to draw ellipses with odd sizes at all. It will always be the same ellipse as x-1, y-1. E.g. an elipse with size 3,3 will result in the same ellipse as the one with size 2,2. It's very small ellipse, its very diificult seen difference. Elipse for same size x and y are circle.I think there is no bug. Well here is a larger ellipse with a vertical line as visual aid. Notice that the two ellipses have the same distance from the vertical line but the upper one should be one pixel larger (touching the line). So, there is a bug unless you can show me otherwise and not just assert it. Its not bug, its beacuce line of both ellipse have aliansing efects and diferenc of 1 pixel is invisible. If 2. elipse have size 59, difference is visible. 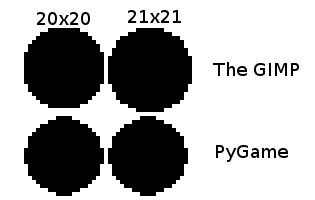 By looking at the code I understand why pygame draws two ellipses of identical size. What I don't understand is why we consider this okay. I think if the API was draw.ellipse(center, x_radius, y_radius) you might have a point that we cannot have floating point radii but given the current API of draw.ellipse(x,y,w,h) I certainly would expect a result similar to the GIMP's output. I strongly prefer 1) though.